En-tice-ment Stables, LLC operates at Obligation Farm located in Harwood, Maryland, central to Annapolis, Baltimore & Washington DC areas. This facility is ideal for personalized learning in a beautiful country setting. We welcome children, adult beginners, novice, intermediate riders and riders who are returning to renew their love of horses. 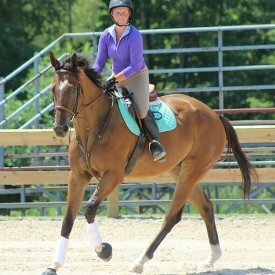 Our lesson programs offer Balanced Seat Equitation, Hunter-Jumper, Dressage & Western instruction by highly qualified Instructors. Our facilities cover over 200 acres of grassy fields, rural trails (.5 miles off of Doden Farm), 4 barns, 1 indoor arena and 1 outdoor lighted riding ring. Our goal is to provide excellent horse care and educate equestrians in all aspects of Horsemanship. En-tice-ment Stables/Obligation Farm can satisfy diverse client needs, miles of trails for pleasurable riding, structured lesson programs for the competitive/non competitive students, youth summer camps, special clinics, and acres of land in a charming country where our clients can relax and enjoy. Whatever your horse interest may be, we invite you to drop by to visit our facility.